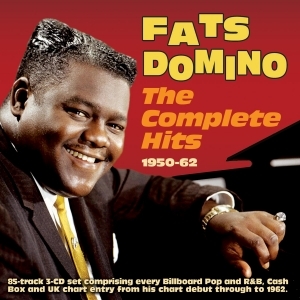 Fats Domino was one of the most important figures in the development and popularisation of rock ‘n’ roll, representing as he did the bridging of the previously yawning gap between the black R&B market and the white mainstream commercial pop scene during the middle years of the 1950s. His career began long before the well-documented rock ‘n’ roll explosion of those years, but he maintained an extraordinary longevity in the charts, to the extent that this 3-CD collection, comprising 85 tracks, consists entirely of his chart entries in the US pop and R&B charts, many of which also made the UK charts, with nine R&B No. 1s among them. His trademark New Orleans R&B style found a distinctive niche in rock ‘n’ roll, with landmark hits like “Ain’t That A Shame”, “Blueberry Hill”, “Blue Monday”, “I’m Walkin’” and “Walkin’ To New Orleans”, and he became a hugely influential and widely respected figure. This anthology is close to being a definitive run-down of his hit-making career, and certainly includes the vast majority of his best-known work, and as such it is a one-stop solution for those looking to have one of the giants of post-war pop in their collection.